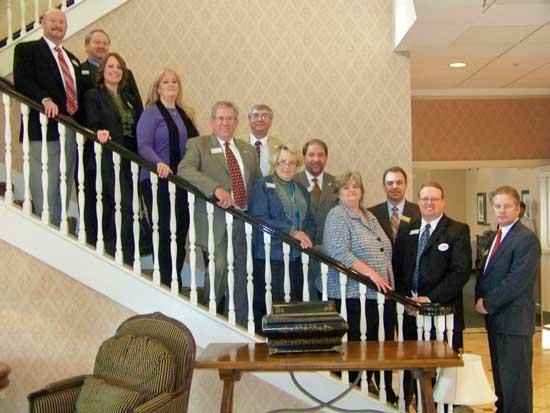 This is the 2010 MTAR Board of Directors shortly after being sworn in at the Stones River Country Club in Murfreesboro on January 14. From left to right: Richard Lewis of Exit Realty Bob Lamb & Associates in Murfreesboro, Mark Messick of Weichert REALTORS® Joe Orr & Associates in Tullahoma, Pam Boles of Crye-Leike REALTORS® in Murfreesboro, Carey Peacock of Royal Properties Realty Co. in Murfreesboro, Dale Patterson of Keller Williams Realty in Murfreesboro, Mack Meeks of Century 21 Mid-State Realty in Winchester, Joyce Johnson of Vance Clay Realty & Auction in Shelbyville, Charlie Montgomery of Comas Montgomery Realty & Auction in Murfreesboro, Janet Nettles of Christine Fisher REALTORS® in Manchester, Darrell Huffman of Exit Realty Bob Lamb & Associates in Murfreesboro, Dave Patton of Prudential Rowland Real Estate in Murfreesboro, and Tim Wilson of Bob Parks Realty in Murfreesboro. Not pictured: Bill Parsley of Parsley & Todd Realty & Auction in Woodbury. The Middle TN Association of REALTORS® held their 2010 Board of Directors Installation Ceremony on Thursday at the Stones River Country Club in Murfreesboro, at which time Dale Patterson and Debra Beagle were named 2009 REALTOR® of the Year and Rookie of the Year, respectively. The ceremony, which was attended by almost 200 MTAR members as well as visiting guests from local organizations, also served as the official beginning of the business year for Tennessee’s 4th largest REALTOR® association and featured the swearing in of the 2010 MTAR Board of Directors. BJ Swinehart, current president of the Tennessee Association of REALTORS®, swore in the MTAR 2010 Board of Directors. This year’s directors consist of Pamela Boles of Crye-Leike REALTORS® in Murfreesboro, MLS Director Scott Boles of Crye-Leike REALTORS® in Murfreesboro, Darrell Huffman of Exit Realty Bob Lamb & Associates in Murfreesboro, Joyce Johnson of Vance Clay Realty & Auction in Shelbyville, Richard Lewis of Exit Realty Bob Lamb and Associates in Murfreesboro, Mack Meeks of Century 21 Mid-State Realty in Winchester, Mark Messick of Weichert REALTORSR® Joe Orr & Associates in Tullahoma, Secretary Charlie Montgomery of Comas Montgomery Realty & Auction in Murfreesboro, President-Elect Janet Nettles of Christine Fisher REALTORS® in Manchester, Bill Parsley of Parsley & Todd Realty & Auction in Woodbury, Dale Patterson of Keller Williams Realty in Murfreesboro, President Dave Patton of Prudential Rowland Real Estate in Murfreesboro, Carey Peacock of Royal Properties Realty Co. in Murfreesboro, and Past-President Tim Wilson of Bob Parks Realty-Northfield in Murfreesboro. REALTOR® of the Year nominees were announced by Past-President Tim Wilson, who noted that nominees are “quality REALTORS® who have not yet received appropriate recognition for their professionalism, dedication, hard work, leadership, and hours of service”. The nominees are evaluated and voted upon by MTAR affiliate (or non-REALTOR®) members based on the agent’s involvement with the association, examples of excellence in their profession, and level of community involvement. This year’s nominees included Lisa Crowell of Coldwell Banker Snow & Wall Realty in Murfreesboro, Richard Lewis of Exit Realty Bob Lamb & Associates in Murfreesboro, and Dale Patterson of Keller Williams Realty in Murfreesboro. Patterson, a new addition to MTAR’s Board of Directors in 2010, is involved with several charitable projects such as the Angel Tree program, St. Jude’s Angel Program, and as a volunteer driver for Meals on Wheels. As 2009 MTAR Public Relations Chairman, Patterson oversaw the Association’s efforts with National Make a Difference Day, the 4th Grade Foresters Project, two charity golf tournaments, Toys for Tots, and relief efforts for children affected by the Good Friday tornadoes. Rookie of the Year nominees are evaluated and selected based on the same criteria as REALTOR® of the year, but also must have been practicing real estate for no more than three years. 2009 Rookie nominees were Debra Beagle of Coldwell Banker Snow & Wall Realty in Murfreesboro and Willie Mangrum of Crye-Leike REALTORS® in Murfreesboro. “Debra gives tirelessly of her time, talent, training, and heart to everyone” remarked Wilson. “She quietly works along side other leaders, and carries her share of the load while learning. Debra is kind, effective, and deserving of this recognition.” During her first year as a REALTOR®, Beagle has already earned the ABR, GRI, E-Pro, and Home Staging Specialist designations, as well as completed the “At Home with Diversity” program. Debra is active in her company, community and church, through her involvement with many fundraising activities, senior counseling services, and public information programs on the tax credit. Debra is bi-lingual, and shares her skill with the Hispanic community through advertisements and membership in the Hispanic Real Estate Professionals group. The Middle Tennessee Association of REALTORS® is a not-for-profit trade association serving over 1,500 real estate professionals across the Middle Tennessee region. The mission of MTAR is to provide its members with state of the art tools, training and support to ensure that all members have the ability to become ethical, professional and successful REALTORS®. MTAR engages in several community service and charity projects each year, including the 4th Grade Foresters project, National Make-A-Difference Day, Toys for Tots, and multiple charity golf tournaments to raise money for college scholarships, diabetes research, and the Coffee County Readers of Tomorrow program. For more information, visit www.mtar.org or call toll-free 877-893-2242.